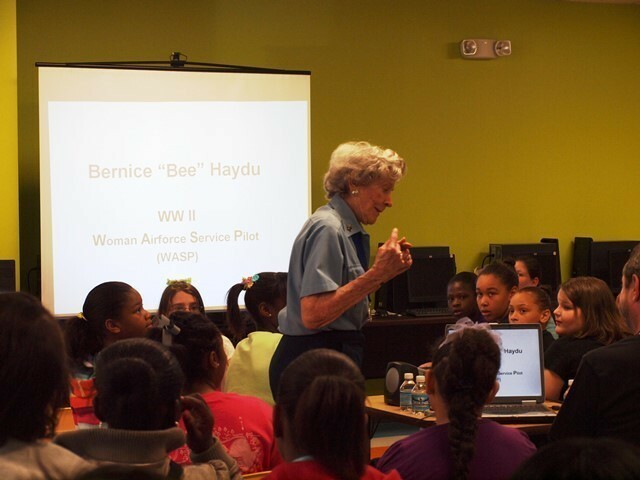 Our History - Aviation Adventures, Inc.
navigation, geography, communications, careers, history and weather, and other aviation related topics.The girls, who successfully completed the classes, and maintained appropriate behavior and academic standards, were able to participate in special programs that exposed them to even more aviation information (museum tours, Young Eagles Flights, RC airplane flying, etc.). The program was such a success that we wrote a workbook "Youth and Aviation Adventure Guide", which is used to develop similar programs. From its inception, we have operated programs in OH, PA, FL, and AR and provided books to be used in other programs in AZ, WA, FL, PA, MD and NM. our determination letter has paved the way for us to seek additional funding to expand and enhance our programs. Our most ambitious program addition is to incorporate flight training to our ground based education programs. The youth we typically serve do not have the economic resources to buy books, have internet access or participate in flight training. Through the acquisition of a Cessna 150, we will be able to provide low-cost or NO-COST flight training to those youth who want to continue their aviation fight education.In September 2014, we purchased a Cessna 150 and presently have her flying with “test students” to work the bugs out and prepare her to fly off to Mobile, AL where one of our full time “No Limits” Program youth will start flight lessons at the conclusion of the school year. conjunction with the FLY-CA residential program. In conjunction with the 2015 Air Race Classic (ARC), Aviation Adventures is leading the youth program at the race terminus locations. Currently in Fairhope, AL for the race terminus, we are bringing together girls for the youth program and the “Adopt-a-Racer” component where racers partner with youth who follow the racers throughout the race. This gives the girls someone on one time with racer/mentors so each participating girl gets a unique experience to share with her peers. We made a return to our program “birthplace”. 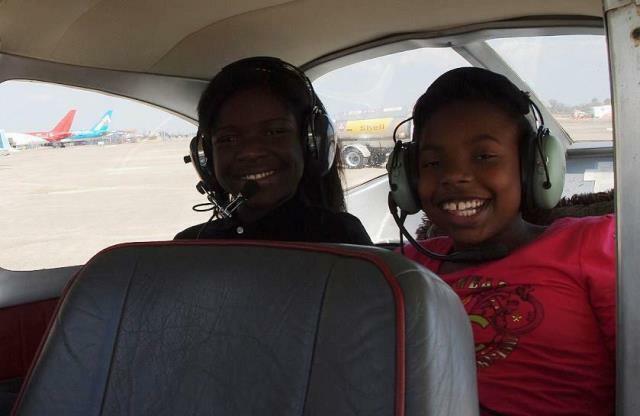 Fifteen of the original participating girls were back to lead the new group of girls entering the program, demonstrating the leadership skills and aviation skills they have acquired through Aviation Adventures over the past 4 years. 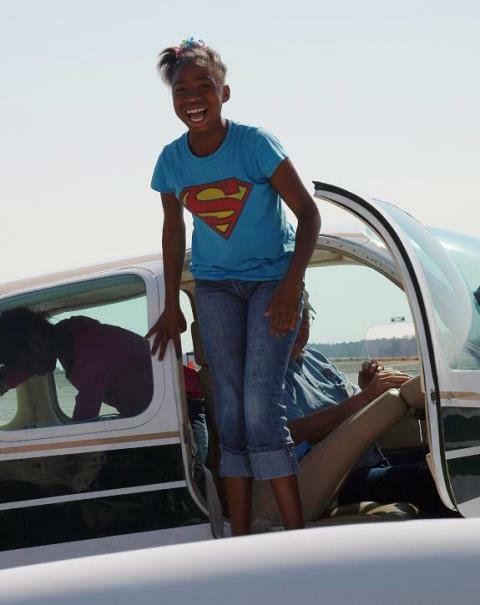 In addition to youth from the South AL Boys & Girls Club, we expanded to include the Emerald Coast Boys & Girls Club for our largest program to date, over 100 girls who all “graduated” from the program when the race roared in to Fairhope in June 2015.
rural or underserved communities need mentoring opportunities.” Aviation Adventures is the answer. We are providing mentors. 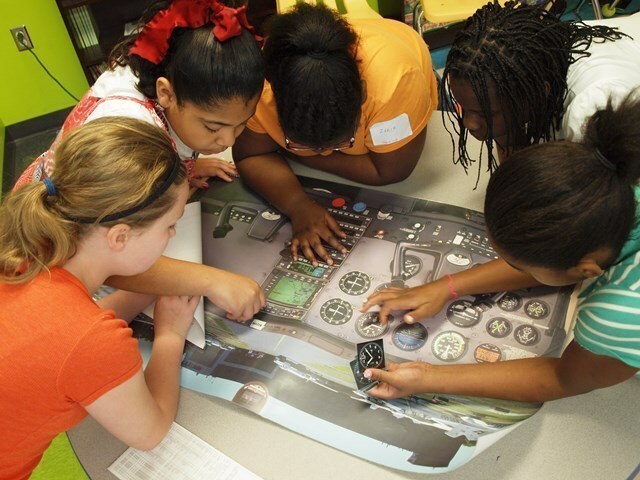 We are providing STEM programs emphasizing aviation as a fun way of learning. We are taking our programs into the under-served communities. We are giving youth the knowledge they are lacking to enter aviation programs such as AV8ers, and other youth oriented aviation programs. We are making a difference in the lives of our youth. Aviation Adventures (AA) is different than other youth oriented program. The youth we serve typically come from economically disadvantaged homes, have challenges in their personal lives and do not have internet access or access to aviation or STEMs programs. We bring our programs to the youth in their neighborhoods and we partner with community assets to provide educational opportunities in the under-served community. chart; they do not know basic United State geography; they are lacking in some basic math skills; most of the youth have never been to an airport, never flown on a commercial airliner and never traveled outside their hometown city; they are not even aware that opportunities exist for them. 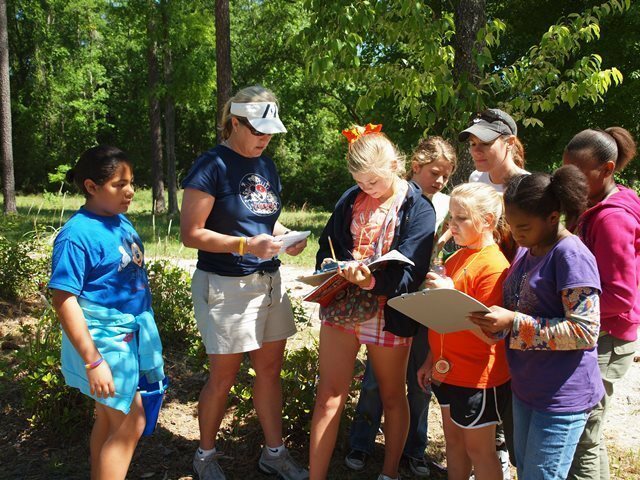 AA programs start with the basics and apply these basic STEM concepts to aviation with fun activities designed to allow youth to learn in a non-classroom environment. Additionally, when youth do not understand the “big picture of life” – that the concepts they learn in school have application in the real world – they are less apt to excel in school or remain in school. AA programs show youth the nexus between school subjects and the opportunities available to them after graduation and we provide mentors to encourage them toward lives of economic productivity in the aviation industry. addition of "Roxie Red Plane" a Cessna 150, we are able to provide no-cost or low cost flight training to students. 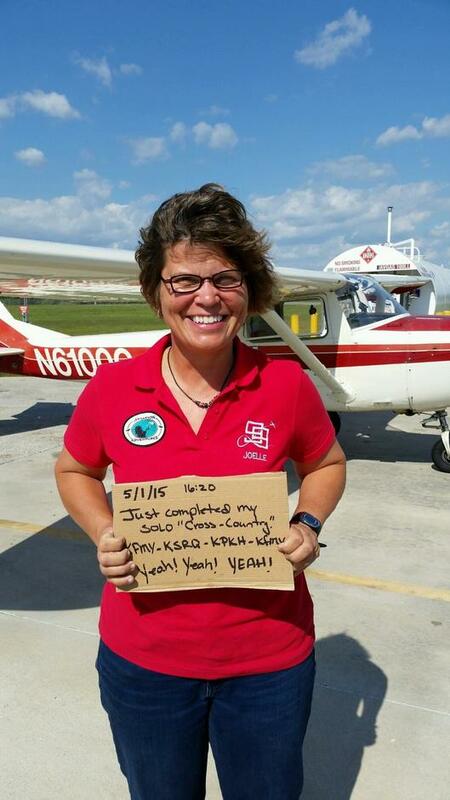 Our first student pilot, Joelle Petersen, earned her private pilot rating in July 2015. Thanks to the generosity of many donors, we are able to outfit Roxie with a full color moving map WAAS GPS and other upgrades to make a full IFR panel for flight training and look forward to providing instrument training as well as private pilot training for our students. Aviation Adventures continues to partner with the Air Race Classic for youth aviation programs held in conjunction with the annual event. We have also branched out to work with local aviation groups who want to give back to the community by educating youth. In 2016, our first boys & girls program formed in Lee County, FL, where the Page Field Aviation Community partnered with Aviation Adventures to start and annual aviation program for local youth. In 2016 Aviation Adventures moved to Jackson, TN under the stewardship of new President, JoAnn Speer. JoAnn is a CFI and will be working with the local youth in Jackson. In 2018, in conjunction with The Ninety-Nines, Inc. International Organization of Women Pilots, Memphis Chapter, Aviation Adventures hosted a 99s "Let's Fly Now!" event providing ground training and first time small airplane rides for 26 local youth, including youth from the local Boys & Girls Club and the local Aviation Explorers Club. Many of these youth expressed an interest in pursuing aviation as a career, calling Roxie Red Plane back into service to begin flight training for the local youth during their summer school break.